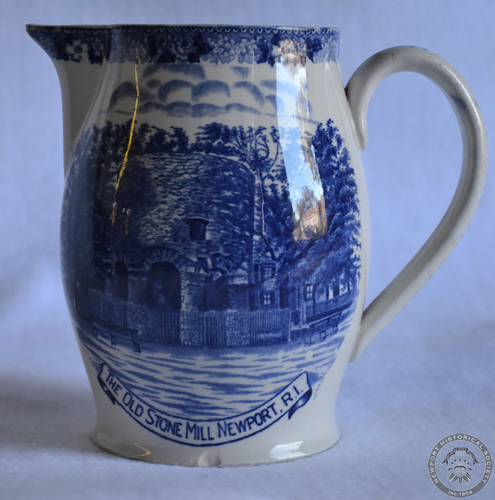 Blue & white pitcher with image of the Old Stone Mill on each side. Caption: "Old Stone Mill Newport, RI", "The Adams/Series/Souvenir/W. Adams & Sons/Tunstall/England/Established 1657", "Made In England For/Daniel F. Sullivan/Old City Hall Hardware Store/ Jones, Mcduffee & Shatton Co. Boston"/Lion & Ball Logo. Made in Tunstall, England.